This image shows the core region of the Rho Ophiuchi Complex, centered around the prominent blue reflection nebula IC 4603. This is one of the nearest star forming regions and the intricacies of the dense interstellar dust clouds in the area provide a spectacular display of light and shade; the contrasting hues making this one of the most dramatic and colourful patches of the entire night sky. 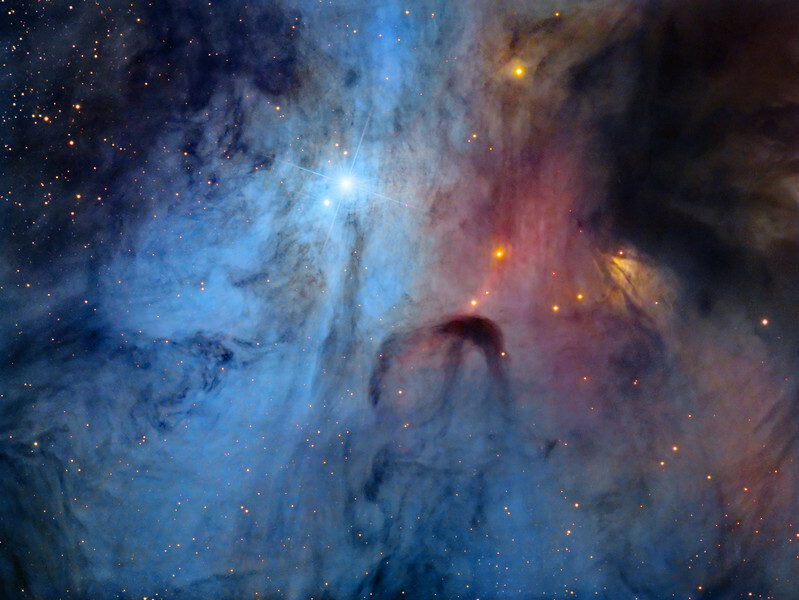 Even the brightest parts of this dusty nebulousity is barely noticeable when viewed through large amateur telescopes. This deep exposure brings out the full splendour of the scene and shows the delicately swirling clouds like an expressionist painting on a giant interstellar canvas. The bright star is 7.9 magnitude SAO184376 which is the main source of light for the blue reflection nebula. The contrasting red areas are primarily illuminated by the red supergiant star Antares, which lies just outside the field of view. Antares has been referred to as the heart of the scorpion since antiquity, and we now know that it is one of the largest stars in existence. The dense nebulousity blocks the usual sprawling star fields that are normally seen near the galactic plane. Instead the area is littered with dim reddish stars, which are typically very young T Tauri stars. Such stars are among the youngest visible stars with masses comparable to our Sun. Because they have only recently condensed out of the surrounding molecular clouds their core temperatures are not yet high enough for hydrogen fusion. Instead they are powered by heat released from gravitational contraction, which lasts until the star reaches a density where the fusion process ignites. For these stars this initial stage of stellar evolution takes approximately 100 million years. The process is typically much faster for blue giant stars which evolve and burn their hydrogen at a furious pace before exploding as brilliant supernovae.